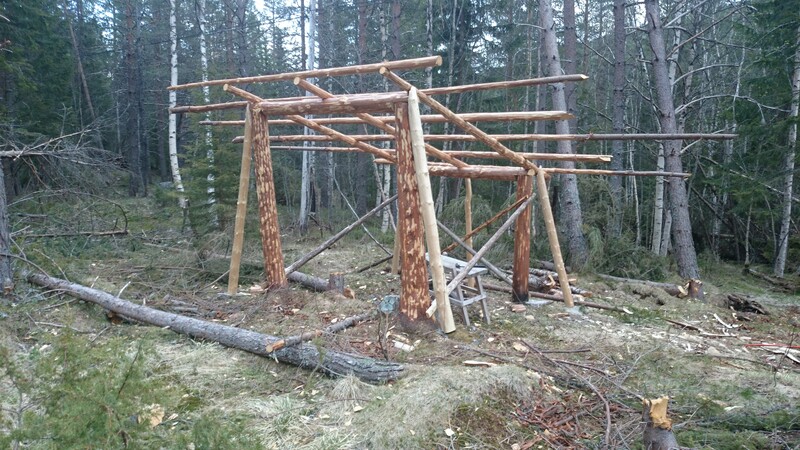 Lately I’ve been working on a shed for firewood. I’m getting pretty tired of using raw birch for firewood (although that does work and I can talk about that in another post). I cut two spruces at about 2.5m hight and used some of the timber from the top for the rear posts, which I dug down. The two trees gives enormous stability for the rest of the structure. 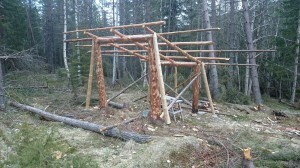 The core structure is made out of whole timber from my property and I only bought nails for joining them. I could have of course have used wooden plugs but I didn’t have an auger to drill the holes with. The roofing and sides will be finished when I have gotten hold of the appropriate materials. What are you going to use for roof and siding? How long do you expect the posts to last? Hey Torjus. I just wanted to send a word of encouragement for whatever it’s worth. I see you haven’t posted for a while. Just wanted to let you know I still love this blog and continue to check for updates! Did you find a good way to tan beaver yet?